It should be noted that this is an apology in the classic sense of the word, (a defense of a position or belief) so that no one think that I’m about to say, “I’m sorry”. On the contrary I’m not sorry at all. I love coffee! I think it’s wonderful. In a matter of fifteen years I’ve gone from drinking international coffee house powdered instant coffee to roasting coffee in my garage and building my own four-cup pour over station for my office. I wouldn’t call it an obsession, but I wouldn’t be offended if someone else insinuated that it is. That being said I have become aware that my coffee snobbery has led to some misunderstandings on what exactly it is that I’m snobbish about. Hopefully this apology will clarify things. Now that we’ve gotten that out of the way I suppose we should start from the beginning. At the age of ten I had my first cup of coffee. Even people who don’t like coffee typically love or at minimum are enticed by the aroma of coffee. I was no different. I had my first cup of coffee while away camping in Canada on Lake Huron with family and friends from church. I’ll never forget having my first couple of sips of coffee while around the campfire at night. Sounds idyllic, doesn’t it? It was bitter and awful. Lord knows how much sugar and milk I put in it to even be able to get it down, and I still wasn’t able to finish it. I don’t think I slept a wink that night. Few things worse than being a wide awake ten-year old in a twenty two foot camper, with four other people. My next forays into coffee wouldn’t be until I was out of high school. In search of hot chocolate and finding none I discovered International Coffee House tins of powdered instant coffee in the cupboard. This was before they started coming up with every flavor of cream imaginable. By my early twenties I had coffee with my favorite flavor of flavored cream, French Vanilla, at church. By then Starbucks had started taking over suburban and urban America, and I eventually weaned myself off, with the persistent nudging of my friend Lauren Dixon of Caramel Apple Ciders and tried cappuccinos (still not sweet enough), and then mochas (sweetness, check!). For years I didn’t venture much outside of Raspberry White Mochas and Peppermint White Mochas. Beginning my career as a local church pastor probably changed everything. Best way to get to know people, have meetings or otherwise get work done is to do so at a coffee shop. How many times have you run into your pastor or someone in full-time Christian ministry at a Starbucks or Caribou? That’s a rhetorical question cause we all know the answer; it seems like they live there! No one has done more for relational ministry than Starbucks. As a first time youth pastor with school loans to begin paying I was getting low on the funds and decided that I needed to find a way to save money on coffee, especially since I was drinking primarily $5 frou-frou drinks. My solution to saving money on coffee was to start making coffee at home. I figured if I was going to do it I was going to do it right, or as the British like to say, “proper”. Caribou coffee who I bought my first bags of beans from had a stock card of tips for brewing at home from which I learned three important things that I stand by today and are some the core values of a true coffee snob such as myself. Always brew coffee using filtered water, otherwise all those minerals and things from the tap muddy the natural flavor of the coffee. Never refrigerate your beans. It’s not a hunk of meat, not to mention there is too much moisture in refrigerators. Contrary to popular belief refrigerators actually speed up the process of coffee beans becoming stale. Only grind your beans right before you are brewing them and only what you intend to use at the time. Use as freshly roasted beans as possible (more on that in a moment). I’ve long had a thing for espresso based drinks, lattes and mochas, and was perfectly happy to get one from Starbucks. Everything changed when Emma and I went to Italy on our honeymoon. I learned what a real macchiato is. I learned the way espresso should actually taste. I’m not a total Starbucks hater. They make and sell great accessories. However, their coffee is generally over roasted. I liken it to going to a steak restaurant ordering a rib-eye medium rare and it comes out black as the night. Upon telling the waiter that you asked for medium rare not well done they reply, “But this is our medium rare.” Which means even their “blonde coffee” is more like mahogany brown. Coffee, good coffee, roasted properly shouldn’t be that bitter and burnt tasting, unless of course the coffee is not fresh. Even before my honeymoon I discovered the difference that having freshly roasted coffee can make. My good buddy Chuck Jones pointed me in the direction of a micro roaster that I could purchase beans from online. The unique thing about this roaster was that they didn’t roast your beans until you ordered them, and they could ship the beans to you within three days. The first time I opened my mailbox to discover the package of beans I ordered from Old Bisbee Roasters, the aroma was such that for a moment I was transported to the throne room of God. When I brewed the coffee it was surprisingly smooth, and balanced (balanced means that it’s not overly acidic), it was easily one of the best cups of coffee I had ever had in my life to that point. I could go on, but here is where I want to give my defense or explanation of what it means for me, and many others to be a coffee snob. There are many people who would claim to be coffee snobs and quite frankly are still drinking mediocre coffee. Many years I ago I learned an important lesson. Never define something by what it’s not. Allow me to violate that principle for a moment. Brewing method is not what being a coffee snob is all about. There’s obviously more than one way to brew a cup of coffee and one is not necessarily better than the rest. When I want a clean light cup of coffee I do pour-over. Pour over is basically a manual way of doing drip coffee, which is fine too but takes a little longer. French press creates I nice rich cup of coffee because the natural oils of the coffee don’t get trapped in a paper filter. A moka-pot takes some skill but when done properly can make a very tasty cup of coffee. At the end of the day only one thing really matters once you’ve used filtered water, and ground your beans right before brewing… the freshness of the beans. Coffee beans have about a six-month life span before they become essentially stale. Most coffee that is sold in grocery stores and even big chain coffee stores is anywhere between three to six months old, at best. Much of the coffee that’s sold in stores sat in a warehouse for Lord knows how long before they even make it to the stock room of said grocery store. Personally I will not purchase a bag of coffee for brewing at home unless I know when it was roasted. Stores like Earthfare, Fresh Marker and Whole Foods carry some coffees that actually have the roast date printed on the label. “Best by” date is not the same as roast date. I have no idea if their timetable for coffee expiring is six months, nine months or a year. Fresh roasted coffee is why I have started roasting my own beans. It gets no fresher than beans you roast yourself. 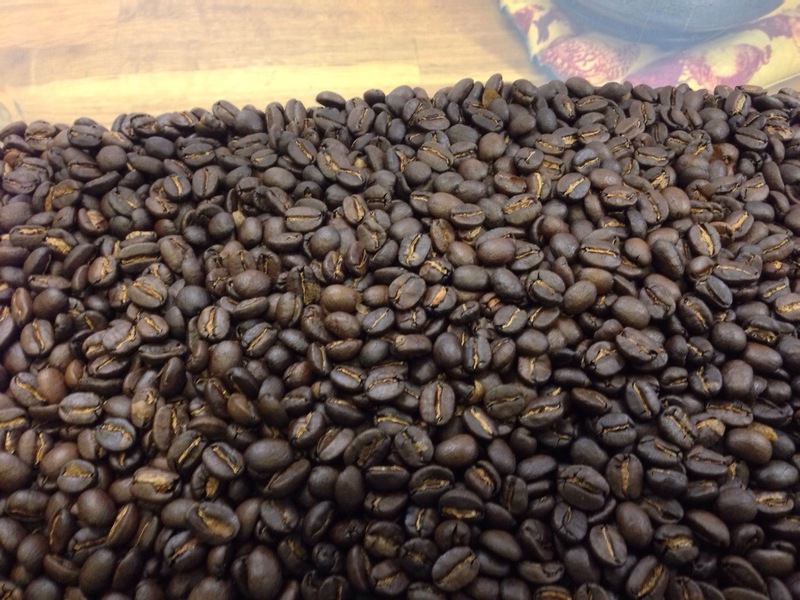 What difference does freshly roasted coffee beans make? I’ve been able to convince more than one person who usually adds milk or cream and sugar to try either coffee I ordered or coffee I’ve roasted that was no more than a week old to drink it black. I made skeptics into believers. They were amazed at how smooth and flavorful coffee can be. Freshness is the main reason why I’ve stayed away from buying a Kuerig, though I understand its appeal to many; there’s possibly no faster method of brewing cup of coffee.